It definitely draws attention to your nether-regions….if you’re into that kind of thing lol. Hey, my eyes are up here, ladies. These pants were actually the official flag of Pitti Uomo this year. A zone that is..full of danger. Now all we need is a picture of someone wearing these with that multi-patterned shirt Joe posted some months back. Noticed these about a month back. Interesting to say the least. I’ll stick with my solid colors. And the leather sleeved blazer. Maybe with that multicolor bonobos wool belt? That will get the ladies focused on the wheelhouse. Who knew pants could have a personality disorder..
the fit looks great…other than that, eff no! Theoretically these pants aren’t any sillier or more suggestive than colorblock swim trunks, which are pretty common and popular and don’t seem to elicit much negative feedback. I don’t mean to endorse these particular pants, but the design itself certainly isn’t novel. My thoughts exactly. These are sort of odd in that I definitely don’t like them, but I can’t say I dislike them either. I think it’s because of the familiarity you describe. I’m just not used to seeing it on long pants. Send a pair to Mark Cuban. They’re in the Mavs throwback color scheme and certainly better-looking than those Sketchers he endorses. terrible. I think its ok to hold pants and board shorts to different standards. wouldn’t wear them to the office, but definitely doable on the weekends. I kinda like em. Not so sure what the big deal here is. Would I buy these? No. Would I wear them casually if they magically appeared in my wardrobe? Heck yes (in moderation and with no other bling). It is the one who knocks. In general I like the Aiden chonos, too bad they have 0 quality control and every color fits completely different than the next. After accidentally cutting gray chino cloth approximately 4 inches longer than needed per pair of gray chino, a genius BR intern suggested “Hey, why don’t we put the gray chino into a different color chino? We could use up the gray and cut the other color cloth shorter?” And the Heritage Pieced Chino was born that day. Reminds of when C-3PO received his oil bath. He was only lowered to his mid-chest area and it always infuriated me. Dunk that Fu**ing droid Luke! You can’t drown it. In my opinion, it’s much easier to get away with colors/ patterns etc. in shorts. Eg – I own plaid shorts which I really like but would not consider buying pants in the same plaid pattern. 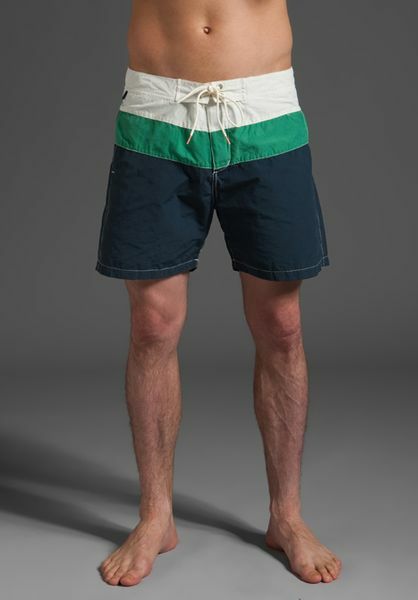 And swim trunks – well you can get away with virtually anything. Formality or informality of it has a lot to do with it, methinks. Right – I’m not saying they are great pants. Just saying, it’s funny to me that so many people are coming out with the “omg a stripe on the crotch lol” comments when the design itself is hardly novel and, in other contexts, doesn’t elicit the same kind of reactions. I’d probably try to rock these. Sure it’s a bit….different, but I definitely don’t hate them. I also don’t mind trying out “fashion risks” though. But isn’t it all about context? eg- Hawaiian shirts at beach/ hawaii/ hawaii shirt nights – great, regular day – not so much.